Migration data received from a sattelite transmitter fitted on Arda, a young griffon Vulture from Rhodope Mountains rewilding area, Bulgaria. 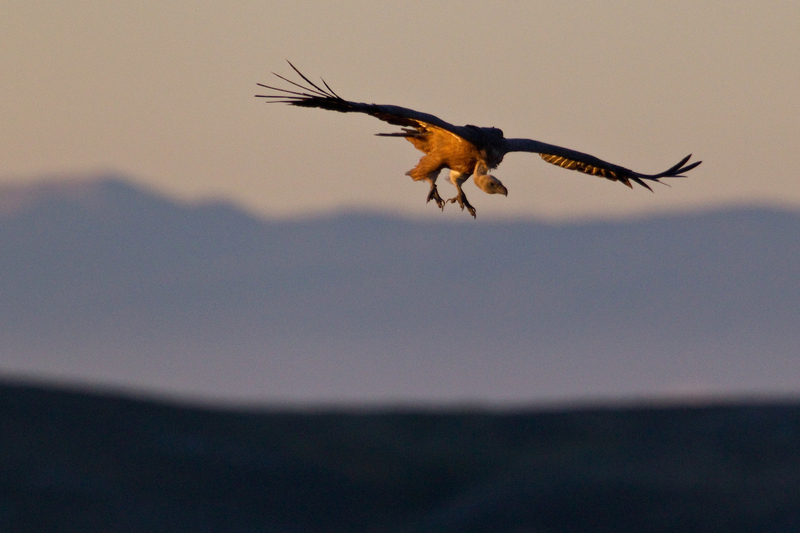 The young griffon vulture named Arda (named after one of the major rivers in the Rhodope Mountains rewilding area) is demonstrating a truly adventurous spirit. Arda is the only young vulture that undertook a long journey so far, while the other two young griffons are currently wandering around in Dadia National Park in Greece. After carefully exploring the Rhodope Mountains, Arda started heading southeast across two continents and six countries, passing Greece, leaving Europe via de Bosphorus Strait, crossing central Turkey and entering into Syria, Iraq, Jordan and finally Saudi Arabia. Currently the young bird is flying over the hot sands of the Arabian Desert and seems to have reached his southernmost point. We all hope that Arda will eventually safely return home to Bulgaria. Griffon vulture in flight during sunset. Unlike other birds species with a strong migratory instinct, griffon vultures are mostly resident or show nomadic behaviour. Regularly, they fly large distances exploring new areas far away from their breeding sites, and return back to their home colonies after a while. Griffon vultures reach maturity at their fifth year, and during their immature period often migrate and cover considerable distances, either on their own or in smaller flocks. The need for better conditions and food is usually not the reason behind this behaviour. It is shown from birds with satellite transmitters that they are able to roam huge areas. This is not without risk: about 70% of the species’ death rate is referred to this period as the vultures cross over unfavourable habitat on their own, without the support of the colony, and have difficulties with finding food, or have accidents e.g. power lines. Satellite tracking enables experts to easily establish the position of the tracked vultures and improves understanding of distribution, movements and threats and thus survival rates of the birds. We will follow Arda and her family members as long as we can, to better understand the conditions and population dynamics of the Madzarhovo breeding colony.